Digital nomads live and work on the move, freed by technology to earn money from anywhere in the world. Anna Behrmann found the idea appealing – but would the reality match up? For some time, I’ve been toying with the idea of packing a bag, grabbing my laptop and taking flight. Not for a holiday or a gap year, but a new way of life, where I can choose to live in any country I want – and keep moving. As a writer, I can potentially live anywhere, and I often catch myself fantasising about where that might be. Perhaps I’d start by tracing my ancestry in Lithuania, walking in the footsteps of my great-grandparents down cobbled streets. My next stop might be the medieval arches of Bologna, where they serve shots of fizzy water in the heat. And then… who knows? I would be joining a new tribe of digital nomads, who have decided to travel the world indefinitely. My flatmate in London introduced me to the concept, spending two years on the move, living in Russia, Brazil, Israel, Belgium, America, Germany and India, while earning an income as a freelance programmer. It’s an idea that appeals to me – finding the freedom and courage to travel as part of a new rhythm of existence. I’d spend time in each place, meeting new people and following the rituals of their lives. When I was 22, I lived in Tel Aviv for eight months and it was the happiest and most free I have ever felt. Every day was a possibility and I wanted to take in the philosophies of everyone I encountered. I allowed myself to be curious, to step outside cynicism and long-held beliefs. 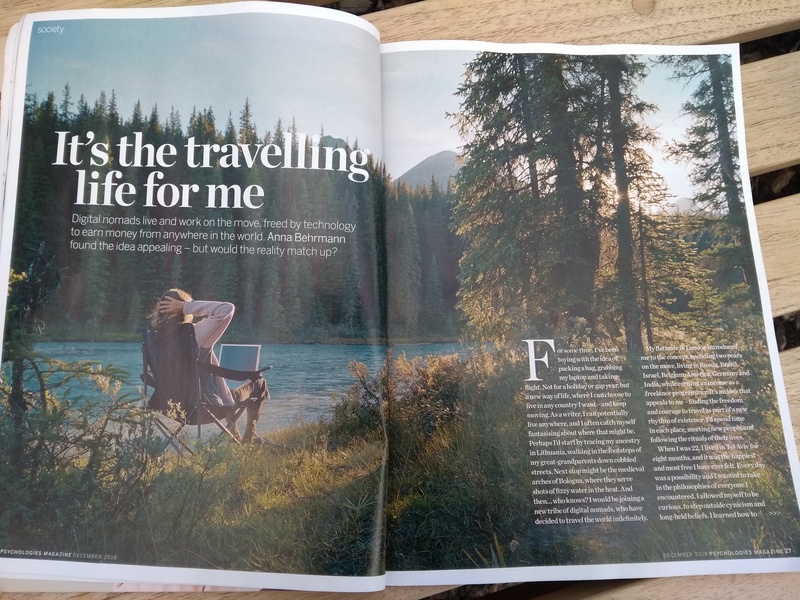 I learned how to enjoy going travelling at my own pace and, six years later, nomadic life is an idea that keeps returning – but I have concerns too. Would my relationships with family and friends lose their intimacy? As I moved on, who would share my memories? I remember one detail my flatmate shared about his wandering life – that kissing a girl in a nightclub was once the emotional highlight of his month. At the age of 28, I am hoping to meet someone special soon, and I have little interest in casual flings. I seek advice from Ellen Bard, 40, a seasoned nomad and freelance occupational psychologist. As we speak over Skype, she apologises for the beating of her fan in the Bangkok heat. Originally from London, Bard has travelled for six years in South East Asia, America and Europe. A few years ago, she bought a place in Thailand , initially as somewhere to rest between trips. For the past six months, she has considered it her home, although she still travels. ‘Travelling has been so interesting and the freedom – being able to go anywhere!’ exclaims Bard, who has also spent time in Iran, Kuwait, Saudi Arabia, Dubai, Singapore, Indonesia, China, Hong Kong, Malaysia, Cambodia and Vietnam. Bard started travelling when she realised her ambitions had changed in her corporate career. ‘I was burning out, and the thing that triggered my leaving was a promotion – one I’d long been waiting for!’ After a ‘crisis weekend’, when she handed in her resignation, Bard visited a digital nomad friend in Thailand, and decided to try the lifestyle. While she has lived in countless places, she has always come back to Chiang Mai, where there is a community of nomads. She tells me, ‘I originally got a house which I only occupied for a third of the year, because I couldn’t cope with having to unpack my bag all the time. It meant I didn’t have to cope with “change fatigue” constantly.’ She remembers one disorientating year in which she took 130 flights and woke up in hotel rooms, unsure of where she was. Bard met her boyfriend a Frenchman living in Thailand, father to a six-year-old, at a party. Her previous experiences of dating, meeting people in various countries on Tinder had been fun, but transient. A big difference between her and I, however, is that she had no fixed plans to start a family, which meant she could enjoy the travelling life while single. Were I to become nomadic, I would certainly feel under more pressure to find a partner. Bard keeps up with her friends and family in the UK online and being a nomad gave her the flexibility to live in the UK when necessary. Her grandparents died within a few months of each other, and she was able to spend a couple of months with them beforehand, something she never would have had the time to do in her corporate career. I also wanted the perspective of American Gigi Griffis, 33, who became a digital nomad in 2012. She is a freelance copywriter and also writes travel books, and in the past six years has been to Canada, the Czech Republic, Switzerland, Belgium, Belize, Croatia, France and Germany, among others. She met her partner at an event for digital nomads and now travels with him and her dog. They are currently looking for a base in Europe, from where they will travel. I find it reassuring that while both women created new travelling lives, both sought out a base. This might be a physical place for Bard, but, for both, nomadic life has been enriched by sharing their experiences with another. While they are still keen travellers, both stress the importance of allowing yourself to settle in one place if that is something you crave. I have learned that being a digital nomad isn’t about being directionless and ambitionless – it’s about organising a life you want. I’d always imagined it as a solitary figure with a laptop, moving endlessly. I’ve concluded that you can design your own life, and it doesn’t have to fit any narrow definition. And so, my dream is taking shape: maybe as a partial digital nomad, where I balance living in London with working abroad for a few months every year. I have also decided that I would prefer to travel with a partner. In the meantime, I feel it’s important to maintain the attitude of a traveller. That is not only about seeing new sights, it is about staying curious; stepping outside my routine, discovering new pleasures, like swimming outdoors, joining an art class, meeting people or venturing inside historic buildings. I see now that my happiness is precious, and I should appreciate everything around me, whether I remain in one place, or discover countries around the world.